Each time I go back to my hometown Kaunas from abroad, I'm warned that I'll find it more dead than ever. Yet with these expectations, I always find it surprisingly alive and bustling. This time, caught in the middle of an exceptionally cold winter, locals have set out to enjoy a windless weekend out. Meanwhile, the Vytautas Magnus University proclaims Kaunas to be the "academic capital of Lithuania". Kaunas is a rather 'condensed' town, in that respect comparable to Gothenburg, Jyvaskyla and maybe Liege. Many local highlights are close to each other and arranged in a very linear manner, along the main streets (Savanoriu ave., Laisves alėja, Vilniaus str.). However, the town provides chances to 'escape' its arteries and enter the more interesting (to my taste) side streets, or take a walk by the river. 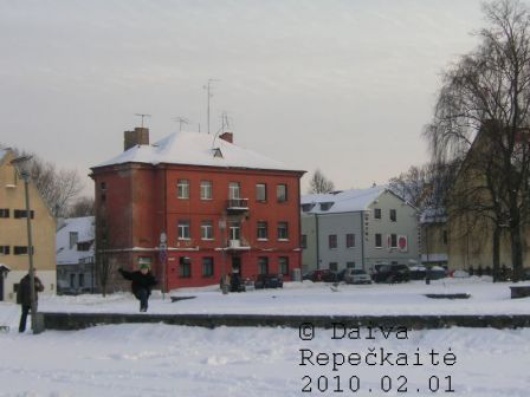 The ancient town was built on the confluence of the two biggest rivers - the Nemunas and the Neris. This fact is so important that we learned the English word 'confluence' in the 6th grade. The place where two rivers become one is really pretty in any season. I like the fact that such open 'natural' spaces are so accessible from the old town, which now looks more or less like this (photo below). Close to the place photographed, there is the Cathedral and many other churches (there is something I'd call the square of churches, amazing concentration), the Town Hall that we are proud of, and the monument to the well-known national revivalist poet Maironis, which is unique because the name 'Maironis' is the only written text on the monument. Apparently, it took great skill to make the monument look like a priest figure, which Maironis was, and at the same time please the Soviet authorities. The monument (sorry, I don't have a picture now) may look dull, but it's interesting when you know the story. 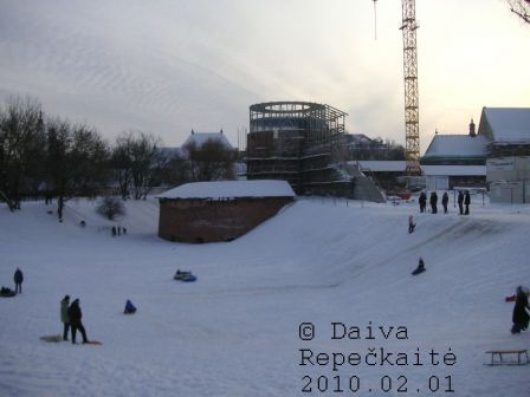 The Kaunas Castle will soon be destr... sorry, 'developed', following a brand new plan by some hyper-modernist architect. As always, such decisions regarding public spaces are taken without any consultations with the public. The ruins of the ancient castle will be drowned in some glass constructions. I saw the project, it looks ugly, but why am I not surprised? 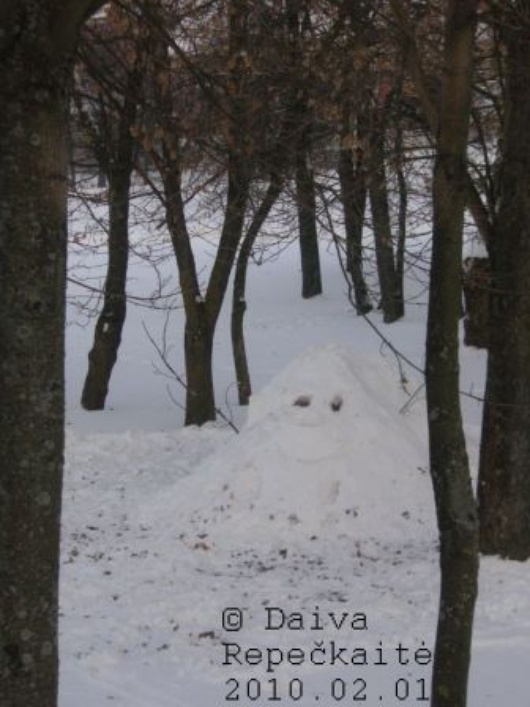 In any case, the castle area is great for winter joys. And this is the newest monument to corruption in Kaunas. Voila! This public toilet cost 600,000 LTL (1 EUR = 3.45 LTL) of taxpayer's money and is said to be unbreakable (i.e. with metal toilet seats). 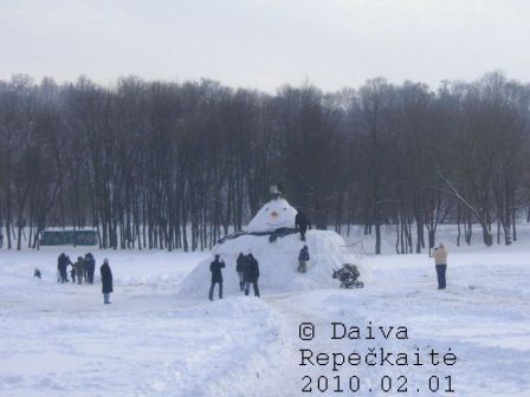 Sorry if it disturbs you, but the yellowish snow around the public toilet suggests that despite the effort of the municipality, people find this public toilet too expensive. Corruption had strangled the famous Vytautas Magnus University a few years ago, and, according to some, still does. However, I was very inspired by the popular revolt by the university students in demanding the resignation of the infamous rector, who is believed to have 'privatised' much of the university's funds. You may not buy everything the new rector says, but since then the university got new plastic windows (so students don't have to wear gloves during lectures anymore), interesting research centres and a vibrant academic life, with conferences, art events and more. I got acquainted with this university when I studied Japanese there in its semi-autonomous [then] Centre for Japanese Studies. Recently its activities have been expanded, and the university offers competitive courses in Asian Studies. VDU/VMU is also the best place in Lithuania to study Anthropology - this is testified by the fact that native-born Vilnius locals move to Kaunas if they want to pursue a degree in this field. Kaunas hosts two universities - Vytautas Magnus University and Kaunas University of Technology. Not blessed with so many governmental links and patterns of money channeling reserved to the capital, these universities had to find ways to become attractive. The former university now specialises in Social Sciences and Humanities, while the latter is proud of numerous patents and inventions produced by its scientists. Along with other universities in Lithuania, they struggle with their outdated scientific base, bureaucratism, low salaries and unmotivating conditions for MA and PhD students. Yet they have developed ways of finding their niche in science and attracting funds from outside of Lithuania. Vilnius Academy of Arts and Vilnius University have subsidiaries in Kaunas, too. In the latter, one can get a degree in 'Lithuanian language and advertising' or 'Computer science for business'. Also, let's not forget the Free University, a grassroots initiative which operates in Kaunas as well as in Vilnius and smaller towns.